Thank you, Coranne and Mandi, for having me on Short and Sweet today! I'd love to share the story of how my new book, Poke, came into the world, in four not-so-easy steps. 1. The idea. After writing novels and stories grounded in reality, I wanted to dip into an unexplored pool of creativity by tackling magic. I decided to stick to my contemporary roots by singling out just a few supernatural elements and placing them in a realistic setting. But ... what supernatural elements would I use? I've always loved Pier's Anthony's Xanth series, in which every character has a talent, or special ability, such as talking to inanimate objects. I wondered what would happen if I gave a character a special ability that created problems for them ... such as ruining his love life. Bent on wreaking havoc on my main character's romantic prospects, I gave him the power to see way too much truth about girls' secrets. When a girl pokes her finger into Zan's belly button (hence the title, POKE), he gets a psychic vision that's ten times more of a buzz-kill than, say, reading her diary. 2. The planning. Sometimes I outline books, sometimes I don't, but I do recommend outlines for beginning writers. I've outlined a few books that I haven't gotten around to writing. Some people think outlining kills the excitement, and my abandoned outlines are proof of that. However, I feel that if the story no longer interests you after the outline stage, perhaps you should change the outline to make it interesting again, or move on to the next one. It's far better to put away a so-so story after spending time outlining than after going and writing the whole thing. For Poke, I created a very simple one-page, point-form outline. I might have spent more time detailing the outline, but that could have been considered cheating, for you see ... I was about to enter the most terrifying contest of my life. 3. The writing. When my friends told me about this contest, where you write a novel in three days, my pulse quickened. Three days? How could that even be possible? Ah, but it was possible, and mere mortals had done it! Of course, for those of you near fainting, I must qualify that the novels written for this contest are generally very short, and many of them are heavily revised more slowly before being unleashed upon friends, families, and gentle readers. 4. The rewriting, etc. Lest you think I've published the convoluted fever-dreams of those three days in novel format, be reassured that significantly more time and attention has been paid! I've expended so much effort editing and revising that, at times, I feel almost furious at myself for doing the first draft in three days and making me look so slow now by comparison. While I have made many changes, and added enough words to make it a thick-sized novella of 50,000 words, all the major events of Poke are—for better or for worse—as I wrote them during the contest. Something about being on a very tight time-line forced me to focus simply on telling a great story and not getting caught up in over-thinking. I couldn't be more thrilled with the final product! Thank you, readers, for getting to know some new authors. I welcome your feedback and your reviews! Dalya is the author of Poke, as well as two realistic, contemporary novels: Practice Cake, and Charlie Woodchuck is a Minor Niner. 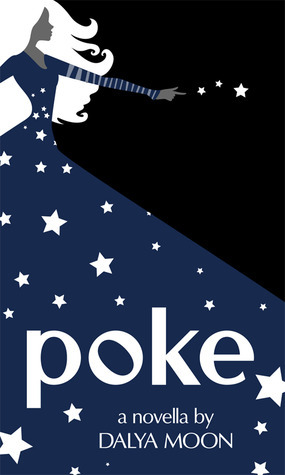 More releases are planned for 2012 and beyond, including a sequel for Poke. "When a girl pokes her finger into Zan's belly button (hence the title, POKE), he gets a psychic vision that's ten times more of a buzz-kill than, say, reading her diary." This sounds like such a wonderful premise. I have to add this to my TBR.